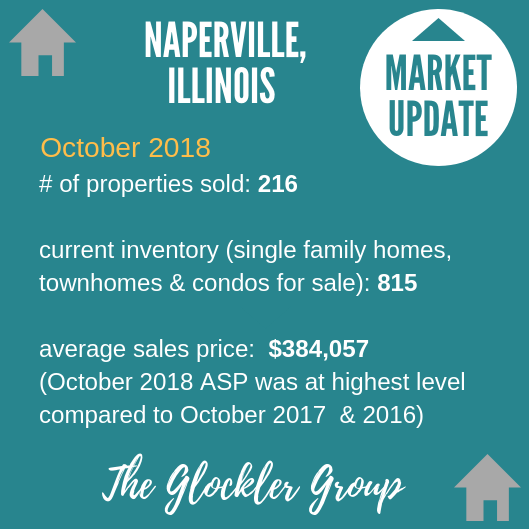 Here is your residential real estate market update for Naperville, Illinois for October 2018. October Property sales were 216, up 15.5% from 187 in October of 2017 and -10.0% lower than the 240 sales last month. October 2018 sales were at their highest level compared to October of 2017 and 2016. The Average Sales Price in October was $384,057, up 5.1% from $365,576 in October 2017. October 2018 ASP was at highest level compared to October of 2017 and 2016. October 2018 Inventory was at a mid range compared to October of 2017 and 2016. Thinking of buying or selling in Naperville? For four decades of award-winning experience, contact us today.